When you think "Doodle" you probably think a fluffy dog that has that "teddy bear" cuteness. The Doodle has become overwhelmingly popular in the past decade and now there are all kinds of Doodles out there: Labradoodle (Labradoor/Poodle), Goldendoodles (Golden Retriever/Poodle), Aussiedoodles (Australian Shepherd/Poodle), Schnoodle (Schnauzer/Poodle), Cockapoo (Cocker Spaniel/Poodle), and of course our favorite the Bernedoodle (Bernese/Poodle but in the Moonstruck program we prefer to cross to multigeneration Labradoodles), but the list of Doodles goes on and on and on. Love 'em or hate 'em, the Dooodles are here to stay. But there's a secret Doodle out there that experienced doodle breeders are familiar with but the general public less so: the Unfurnished Doodle. The Unfurnished Doodle is a well accepted fact of breeding doodles, but they are not well known away from the breeding communities as they are not openly talked about too much. It's like they are the embarrassing, ugly sibling that no one wants to admit is very much a part of the family! When breeding doodles it is important to understand how the presence or absence of the Furnishings gene contributes to how the next generation will look. Now there is more to the coat type and shedding levels than just this one gene we are talking about here. There are several other identified and unidentified genes that play a roll in the type of coat a dog possesses, but we are going to keep it all simple here and focus just on Furnishings. Poodles are a furnished breed. All Poodle genotypes looks like this: FF. They receive one F from their mother and one F from their father. Simple enough. Now when you Doodle a dog, let's use the Bernese Mountain Dog because we breed Bernedoodles, you now introduce a new genotype to the mix: f. All BMD's are ff. f is recessive to F. So, when you breed a Poodle (FF) to a BMD (ff) all of the offspring are Ff. This means they get one F from their Poodle parent and one f from their BMD parent and the dominance of F causes them all to be fluffy doodle looking dogs. A first generation Doodle like this is referred to as an F1 - the F in F1 has nothing to do with Furnishings (F) (I know, it's confusing!). Now, here's where it can get a little challenging because the generation lingo can be a bit misleading. This is why you need to know the background of the breeding AND the Furnishings status of the dog. Many inexperienced or unknowledgeable breeders will use an F1b dog in their pairing and make the statement that ALL of the coats in the litter will be "perfect". An F1b dog can be an IC (f) carrier. To know whether or not the dog is or is not a carrier of this gene it must be genetically tested. Aussie Mountain Doodles are the result of Australian Shepherd infusion to the Bernese and Poodle/Doodle gene pool. Here we have an example of an F1 Aussiedoodle (Australian Shepherd/Poodle) bred with an F1 Australian Bernedoodle (Bernese Mnt. Dog/Australian Labradoodle). 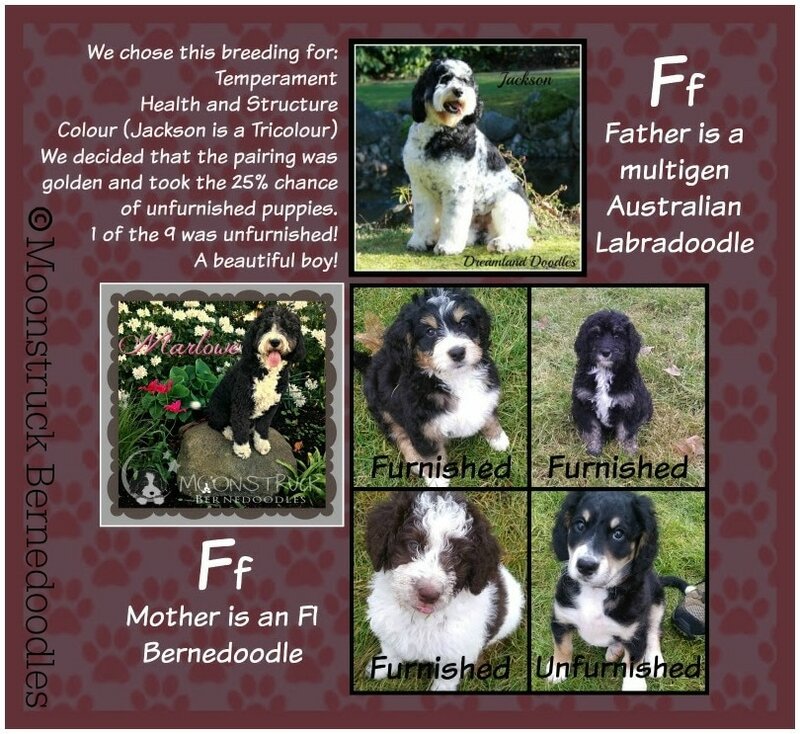 The result are these gorgeous F2 Aussie Mountain Doodles. Note: The "Australian" in Australian Shepherd and Australian Labradoodle have nothing to do with each other and can get a little confusing! This is why it is so important to fully research and understand the background of the crossbred dog you choose! ​Now, when a breeder chooses to breed an F1 dog (Ff) they need to make a decision. If they breed an Ff dog to another Ff dog, statistically speaking they are going to end up with 25% of the puppies being ff. This means the puppies are not furnished and they do not have the fluffy doodle look that their siblings will no doubt display. These puppies are commonly referred to being IC Affected. 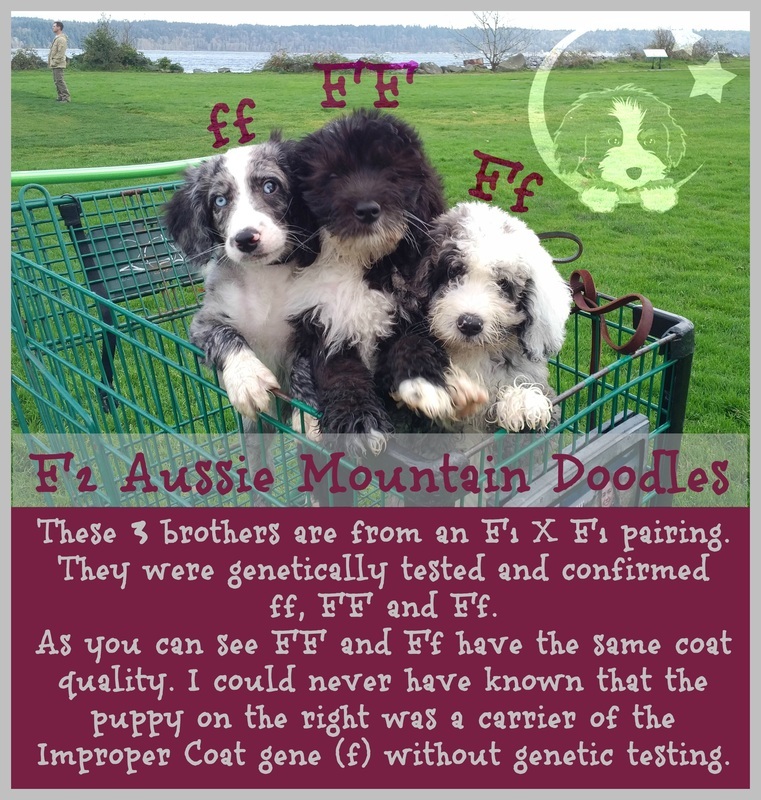 Each parent carried a copy of the Improper Coat (IC) gene which is the small f. This is the main reason why you do not see a lot of experienced doodle breeders breeding two F1 dogs together. They do not want to produce IC Affected puppies. Usually an F1 is then bred back to a Poodle (FF) so there is no chance of any of the puppies being IC Affected. Of course these IC puppies are healthy and wonderful in every way, the just look different. ​When breeding multigeneration dogs, experienced breeders will genetically test their dogs to avoid breeding two IC carriers together as you cannot tell the dogs genotype status simply by looking at them. So, what is the big deal?? In my opinion: NOTHING!! Unfurnished puppies are something that is not ideal in the Doodle breeds, but there is nothing wrong with them at all. In fact, they may be MORE desirable than a furnished doodle, depending on the needs/wants of the family. I get more comments, when I walk around town with Bernedoodle puppies, that denote many people like the concept of the doodle (temperament, size, more diverse gene pool, etc.) but the coat upkeep with the brushing and grooming requirements are a total turn off. They don't realize that they can have their cake and eat it too! There are some trade offs when you are looking at an Unfurnished Doodle. They usually shed like a "normal dog", but generally (though this is not ever a guarantee) not as intensely as the original parent breed (let's say Bernese Mountain Dog in our case), as there are other Poodle influences at play. The Unfurished Doodle's coat is much more unpredictable. What they look like as a puppy may very well change dramatically into adulthood. The dog can become wirey and scruffy - always having that unkempt look to them, they may maintain a sleeker look, they may sprout random scraggly bits.... it's kind of a fun mystery and you can usually bet that your Unfurnished Doodle will get all kinds of attention simply for being incredibly unique... Disney Dogs I call them :) These trade offs may not even be considered a trade off to some. An Unfurnished Doodle is very likely not going to require constant grooming, both at home and professional clipping. They generally do not get as filthy because they do not possess the kind of coat that is "swiffer-like", grabbing all of the road dirt, mud, burs, sticks, snow, etc. Their coat may shed, but the overall maintenance is completely different than that of a Furnished Doodle. Unfurnished Doodles tend to have little-no muzzle hair (and if they do it's sparce) which means no smelly, wet, messy beards to keep clean, no hairy ears to pluck (which decreases the risk of ear infections), and no walking into walls because they can't see through their mop of hair. Furnished Doodles usually require a dedicated grooming schedule or they end up shaved at the groomer because the mats and knotting was too much to overcome. Unfurnished Doodles do not generally have this problem because they do not have a thick, long, messy coat to upkeep. Some people want a big, fluffy typical doodle coat and some people simply do not. Unfurnished Doodles are the answer for those that like doodles, but don't like the grooming chores that come with all that coat! So, now you know a little about Unfurnished Doodles. Moonstruck Bernedoodles breeds for Temperament and Health as priority number one. This means, that on occasion, we will choose to have a litter that will produce a percentage of Unfurnished Doodle puppies. If you are interested in an Unfurnished Doodle as a loving addition to your family, please contact us to see if we expect any litters that will have Unfurnished puppies in the litter!